However hard the weather may be, the springs feeding the old watercress beds always continue to flow. They rise from a depth that is beyond reach of the frost, and on a cold day the water, which is limpid and sweet, feels almost warm to the touch. It flows across a mud and gravel bottom, making a stream that is here broad and there narrow, occasionally becoming louder as it drops an inch or two from one bed into the next. Years ago, when these beds were worked commercially, the stream was controlled by a system of sluices and gates. Like the men who worked them, the sluices have gone now, rotted away, and the stream has to find its own passage through the sedges and willowherb. The cress then was eaten in local salads or decorated more expensive dishes in the West End; now it remains where it is, and makes an unpolluted home for a rich and abundant population of small aquatic invertebrates – worms, insect larvae, and the rest. They are the set lunch for certain birds that may be found at cress beds more often than in most other places of the district. The beds here in the Gade Valley, as well as along the Colne and the Chess, form an important winter habitat for ducks and waders, and for wagtails and pipits – including the water pipit, once thought to be very rare but now known to be a regular visitor to watercress beds throughout the country. This discovery was made locally by a local bird-watcher to whom these abandoned ditches at Watford, between Bellmount Wood Avenue and the canal, are well known. Quite often a few snipe are to be found here. If disturbed, they will fly up with a soft yet rasping cry, and pitch again after circling in a towering spiral that may take them two or three hundred yards further along the ditches. As might be expected of a gamebird, the snipe is extremely wary and unapproachable; but, if seen close to, it is revealed as a slender, thrush-sized bird beautifully camouflaged with brown and darker brown. The lower breast and vent are pure white; the legs are green; and the bill, which is inordinately long and equipped with a sensitive and slightly bulbous tip, is worked with a sewing-machine action in the mud. The common snipe is usually silent as it feeds. Its smaller and scarcer relative, the jack snipe, however, progresses through the shallows with a series of inward and absent-minded grunts, as I once learned when I was lucky enough to observe one from a range of only six feet. I was thirteen then, concealed in a cramped hide, made from bits of scrap wood and bundles of dry willowherb, which a like-minded school friend and I had constructed beside one of the ditches. From the same spot we watched most of the birds of the ditches in intimate detail. 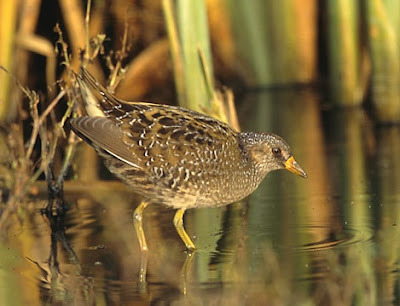 Besides the common sorts that came down to drink or bathe or look for insects, and besides the moorhens that may be found by almost any scrap of water, there were water rails – like smaller, drabber moorhens with a longer bill – and during several memorable dusks, up to four even smaller and drabber rails called spotted crakes – unusual birds indeed. At that time there were three ditches, instead of the one that remains. They were separated by a tangle of reeds and scrub that held breeding pheasants, whitethroats, and sedge warblers, and in winter a large pied wagtail roost. From November to March the ditches would often produce a green sandpiper or two, besides other, scarcer, waders, a good number of mallard, and ten or twenty teal. All that has now gone, buried under the sterile expanse of some rugby pitches which hardly ever seem to be used. Too late the site was declared a nature reserve; the bulldozers have driven the best of the birds elsewhere. A few of them may be found a mile or two downstream, at the cress beds lying between the canal and Cassio Lake. A public footpath runs along one end, beside a rickety corrugated iron fence which helps to conceal your presence. Here, if you are quiet and prepared to wait, you have a very good chance of seeing kingfishers, herons, water rails, snipe, grey wagtails, and, a speciality of these beds, teal. During the recent cold snap there were upwards of fifty teal feeding busily among the cress near the fence, giving marvellous views. They had homed in from icebound ponds and streams up and down the valley and beyond. Like the snipe, the moorhens and mallard, and all the other birds, they rely on the warmth of the springs for their emergency supplies of food. The cress beds, at least, always remain open for customers, no matter how low the mercury falls.